Apparently my comment was too long to make the cut on Toni's NAA blog post. So here it is for those that would like to hear my thoughts. A blog post about print not being dead. Hmm, a bit ironic, don’tcha think? Well, it is what it is. So, here goes. As Level One pointed out last week at the AIM conference, our industry has a very difficult time measuring traffic sources even with the technology of today. Only 29% of leads are tracked properly to the source according to their data. http://www.apartmentinternetmarketing.com/resource-library/slides/?action=view&id=41 I believe this is interesting as the data we collect, even today, cannot be trusted. This actually helps validate an argument for print (sort of). That being said, I know with our experience we have continued to see the quality and quantity of our online leads/leases increase over the last few years. We've also seen the number of print leads/leases decrease over the past few years. This is, at least, according to our inaccurate numbers that apparently are only 30% correct. However, when quality goes up, the ROI bell goes off in my office. Where there is a disconnect for me is with the quantity argument and “The print medium is vital to the flow of traffic to your property!” comment. Are we looking for quantity or quality? I would prefer 5 quality leads over 10 mediocre leads. I will argue that the listing guides and other print forms of advertising provide less quality leads compared to online sources strictly due to lack of information that the print provides. Print may drive people to search online, but if we can be found online without having the expense of print to get people there then the ROI just makes more sense. Here’s my mini case study that is still a work in progress, but I believe it will be even more relevant by the fall. During the last 3 months the majority of our portfolio is no longer using the listing guides (or any mass print advertising) as marketing resources. While we have taken a portion of those huge savings and invested them into other online listing services and enhancements to our company online presence, we have still reduced our marketing costs per unit by more than $30 on average. So, what’s the result? Only 1 community out of all that dropped the print listings has had fewer traffic/showings compared to the same period last year. And they weren’t off by much. This is also in what many call a “down” market. Pretty amazing in my opinion. Does this example represent all markets or all property types, no. 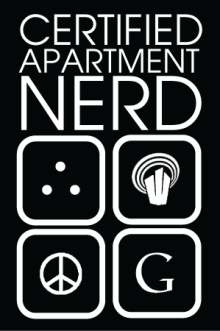 However, it does show that print is not a necessary piece to marketing an apartment community, and without it those savings can be spent in other places that have a better impact on quality of leads vs. quantity. Sales is a numbers game, but there is also a marketing ROI that can’t be overlooked. OK, now onto your “Online Ad” argument. You make a great point. Online ads do disappear into cyber oblivion. However, if you look at where online is going you’ll see the best marketers saw that many moons ago, and they are now focused on search results, creating online community, or embracing customer testimonial/ratings sites like Yelp! It’s not about shouting your message, it’s about sharing your message. We dropped all our banner ads online even before dropping the print. Messages now need to be targeted and specific. They cannot be an interruption to one’s regular activities. I would even argue that the listing guides are actually great permission marketing sources. No one is going to just pick one of those up for leisure bathroom reading or as coffee table décor. People pick it up for a reason, they need an apartment. However, the ROI for these print listings continues to slip, and it’s easier than ever for marketers to reallocate just a portion of those dollars for results that are equal to or greater than before. 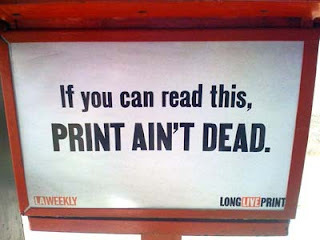 From my perspective this isn’t a question of evaluating whether or not print is DEAD. The question management companies need to ask themselves is if they can continue to justify the ROI for print marketing. If you can justify it, great! If not, don’t be that guy continuing to do things the way we’ve always done it. Go for it! Do your homework, find an online marketing consultant to help you if necessary, and change the way you share your message. Print doesn’t have a NEW partner, the Internet has an OLD partner. Thanks, Mark, for sharing your case study. You really caught my attention in your closing statement when you said, "...don't be that guy continuing to do things the way we've always done it." Although many of us strive everyday to innovate and automate with technology, our industry isn't quick to embrace new processes built to react to emerging consumer trends. I wonder if that's from fear of leaving what we think is a sure thing, or if a lot of what we read and hear continues to be the same old song from a jukebox stocked with the accepted, traditional choices. I'm with you, where is our Go-For-It attitude? Thanks Tracy. Sorry for the delayed comment back. For some reason I wasn't getting the notifications. Anyway, I appreciate the comment and thank you for your support. I had a manager once tell me to continue to challenge ideas, and it's stuck with me. Cheers to shaking it up! To continue on that "don't be that guy" thought, what part do you think owners play in all this? As an owner I was always a supporter in more and better technology in the back office (Yardi, MRI, AMSI etc.) and the customer-facing 'office'. Nevertheless, I was always surprised to hear from mgmt. cos. that some of their owners did not appreciate the 'extra expense' of some of these initiatives. Do you think that there is an unwillingness by owners or mgmt. cos. to try something new, or is it that many have not yet figured what and how to do it? Thanks for the comment. I believe one challenge limiting companies can be the part owners play. That being said, every real estate investment is different and I can respect decisions that are made from a financial perspective to limit new technology implementation. Take Urbane for example. While Eric and his team are an industry leader in online marketing and social media, they still use Excel spreadsheets to manage their portfolio. It's a financial decision he chooses to make and not a technology decision. As you said, maybe the "extra expense" is really where the hang-up is? New technology is often viewed as just an extra expense. Many owners really analyze the expense lines, and marketing/technology always seem to get cut first. So my suggestion to the marketers out there that want the latest and greatest technology and tools is to take a hard look at your expenses (just like an owner would) and see if you can reallocate those dollars to get the upgrade. Not only did we cut our marketing cost/unit by $30, we added 3 new ILS services, an overflow call center, and budgeted for Firebelly Marketing to provide us their services on a monthly basis. The dollars are there, take the plunge.